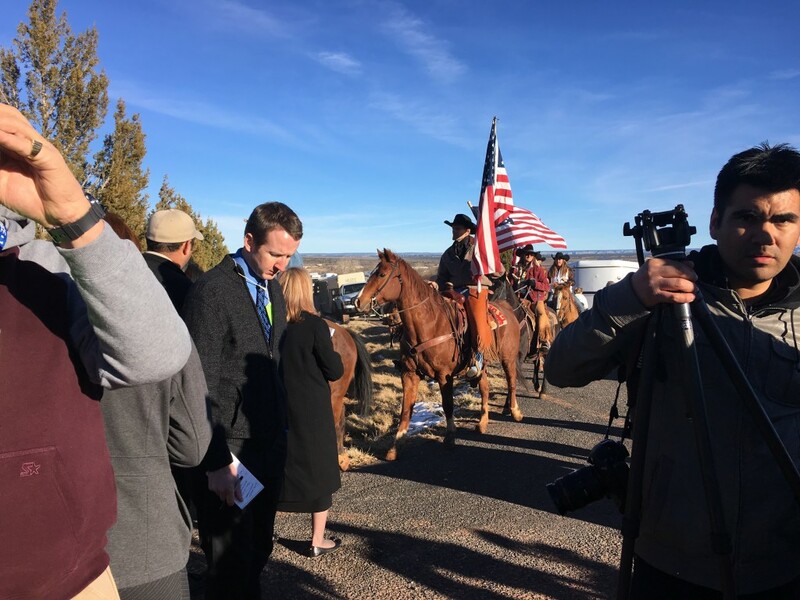 This, according to his eldest daughters, Thara Tenney and Belle Collier, who confronted by a phalanx of cameras and microphones after their father’s funeral Friday likened Finicum to great reformers such as George Washington and Thomas Jefferson. Encircling them, several armed supporters many of them displaying the insignias of the Oath Keeper and Three Percenter militias, kept watch as the daughters addressed the media. The crowd nearby demonstrated their loyalty to Finicum and his family by interjecting calls of “Hear, hear,” during the press conference. 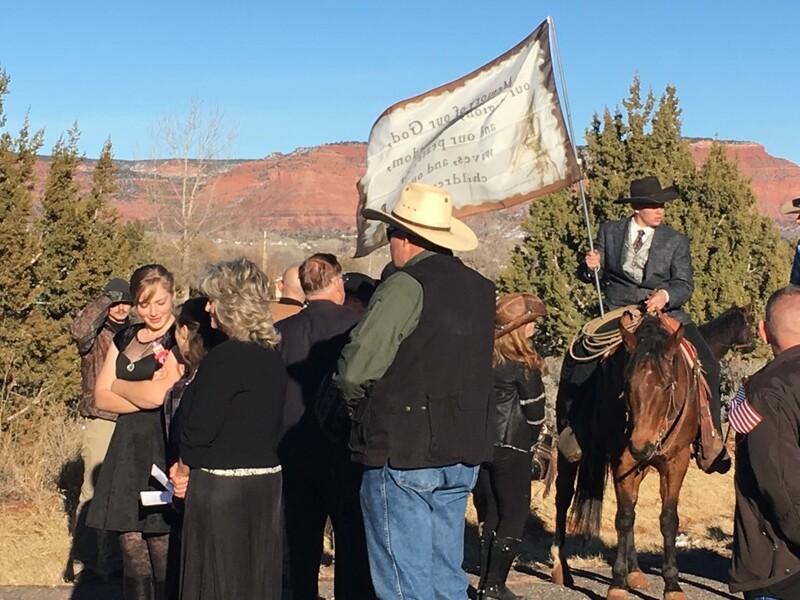 More than 1,000 people came to pay respects to Finicum and his family Friday at a Kanab stake center for The Church of Jesus Christ of Latter-day Saints. During the viewing, Finicum’s body lay dressed in white with an American flag placed across his chest. He was in an open wooden coffin built by his family. 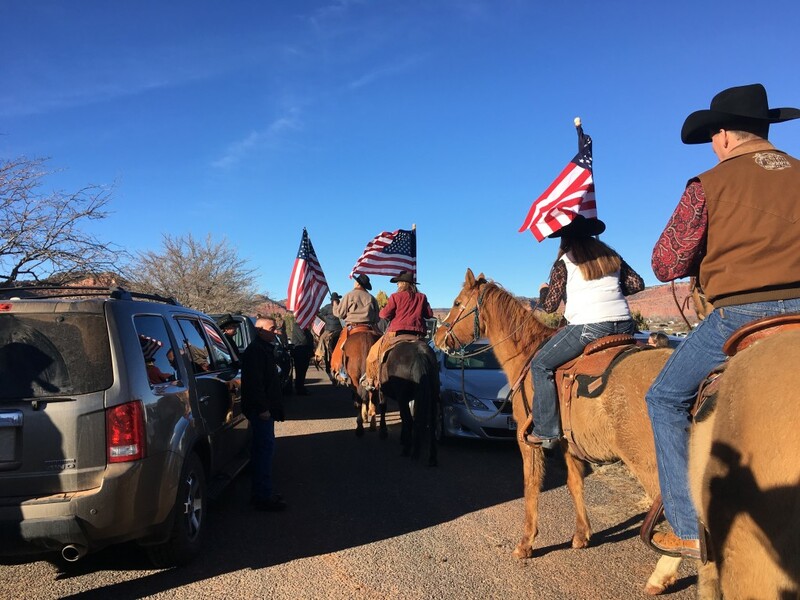 With their hats in hand, as they paid their respects, many of those in attendance at the funeral were cowboys themselves wearing boots and jeans – the same attire Finicum would have been found in at any given moment. The viewing for Finicum started at 11 a.m., about the same time an unmarked white drone started its all-day flying stint over the chapel – many in attendance speculated the FBI was overseeing the action. The Oregon State Police shot and killed Finicum just a day short of his 55th birthday after he spent three weeks participating in an armed occupation at a southeastern Oregon federal wildlife refuge. 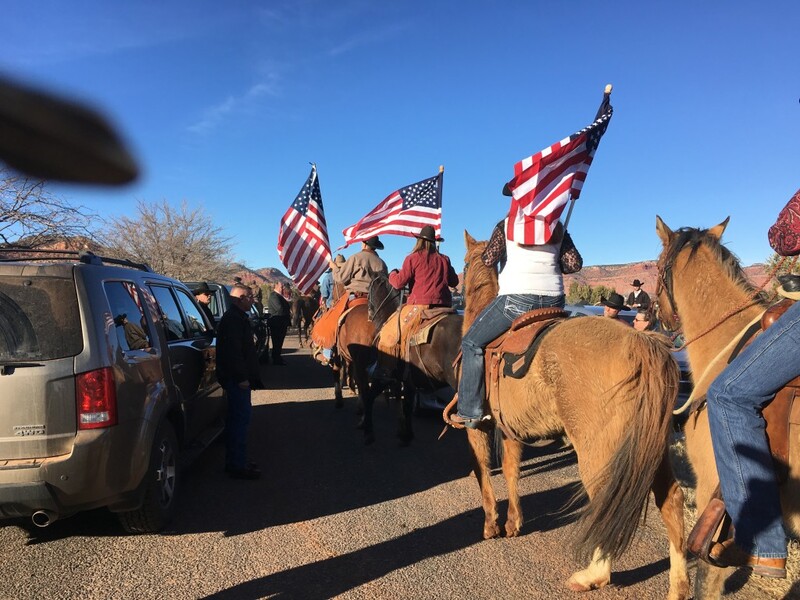 Now considered by those in the “patriot movement” a martyr for freedom, many Finicum sympathizers supported his daughters’ demand for an independent investigation into what happened that day on Highway 395. Others there vowed to vindicate Finicum’s death by continuing his fight for freedom and the Constitution. Finicum’s death has led to protests by many who believe the FBI and Oregon State Police were unjustified in their use of force. Some in attendance at the funeral only vaguely knew Finicum. Others had never met him but knew him as the spokesman for the group that had taken over the Malheur National Refuge. The occupation was made, the group said, to demonstrate against the imprisonment of two Oregon ranchers. It didn’t seem to matter the relationship, to these people Finicum’s death is symbolic of the power the federal government wields over public lands in the West and elsewhere. That power is something Finicum spent the last few years decrying. 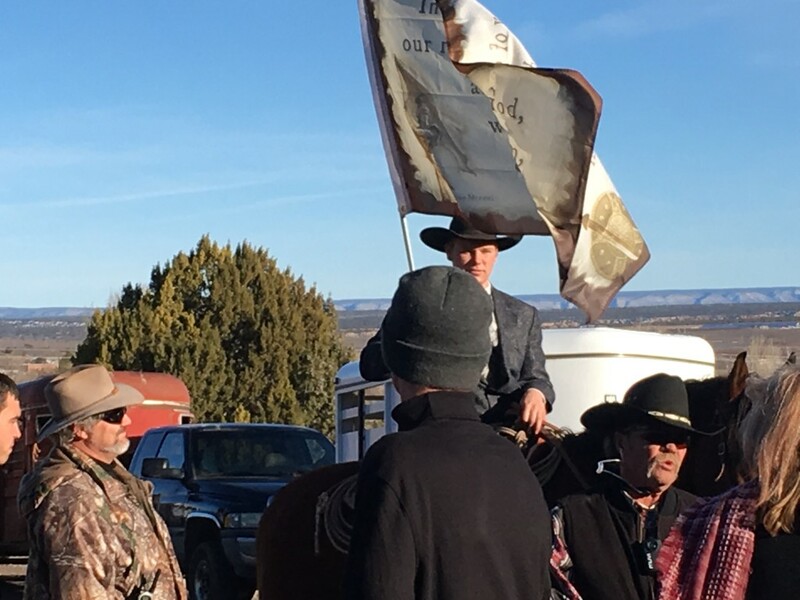 Finicum, like his counterparts Cliven Bundy and sons, have actively protested in recent years the federal government’s ownership of Western lands and its overreach into citizens’ private lives – something they maintain is unconstitutional. Finicum’s 11 children each remembered their father during the services by recapping some of their memories. 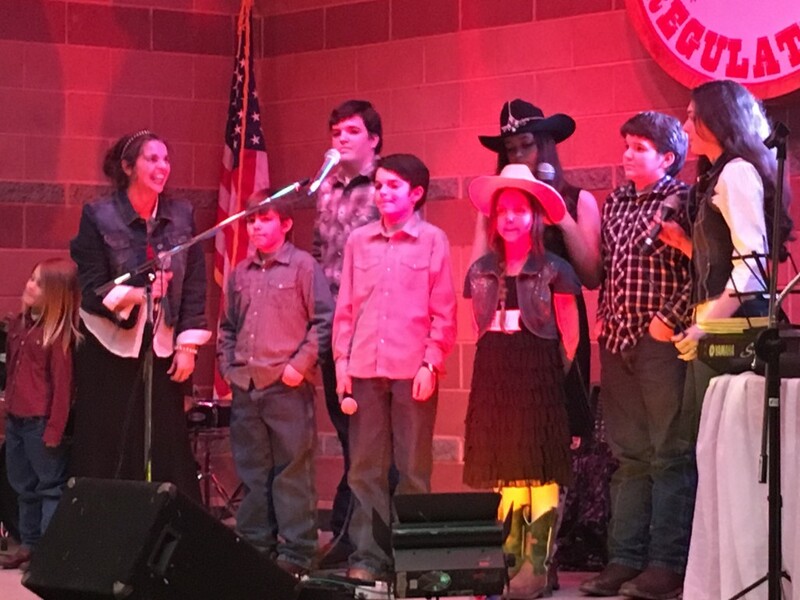 They remembered him for the family board games they fondly said their dad often made everyone play for days, the wisdom he imparted to them as they worked side by side with him on the family ranch, and the times he sang to them – although admittedly, they said joking, tone deaf. The daughters also shared how their dad had taught them how to ride horses and brand cattle alongside his sons. The service itself did not touch on whether the FBI shooting was justified or even on the land-rights movement. Finicum was portrayed by those who loved him as a man of faith, a hard worker who always rose early to meet the day and who occasionally enjoyed a few pranks. Finicum, the father, the grandfather and the husband was a hero to his family. A strong man, his family called him and said he often looked to the Lord for his answers. He was an avid reader of books referencing God and the Constitution, they said. He also studied scripture every night and encouraged his children to be active in the LDS faith. Outside the funeral services, the family had set up displays that included Finicum’s wooden rocking chair and the table where the books he was reading of late were placed and next to them was a note that read: “Dad’s ‘light’ reading.” The books included Alexis de Tocqueville’s “Democracy in America,” one by LDS Prophet Ezra Taft Benson, who often wrote about the U.S. government and the Constitution, and other books about U.S. history, the Founding Fathers and the Constitution. Spurs, boots and photos of Finicum and his family taken from the refuge were also on display in the stake center. A bowl at the funeral was filled with pieces of a blue tarp for supporters to pin to their clothes. Finicum gained notoriety as “Tarp Man” at the Oregon refuge for keeping watch at night with his gun under a blue tarp in case the government showed up – a portrayal the family disputes. During the press conference, Finicum’s daughter Tenney denied this depiction by admitting she had been at the refuge and knows the truth. Finicum’s daughters also characterized their father as one who upholds the law. Tenney also shared with the press how his children will miss the embrace of their dad who they could always count on to be there. Yet, she said, he had nobody to hold onto as he died in the snow along a desolate stretch of highway in eastern Oregon. For those who didn’t personally know and love him, Finicum will largely be remembered for his role in the refuge occupation that ended with his violent death. A death, captured on FBI video the entire world replayed online for days attempting to formulate their own theory of what really happened. FBI footage showed: Finicum tried to outrun law enforcement in a vehicle; to avoid a blockade, he veered off into a snowbank nearly missing a police officer; he then threw open the truck door and jumped out and trudged through the snow with his arms held out to the side, (all the while, witnesses said, he was yelling “shoot me, are you going to shoot me, just shoot me then”); several times Finicum grabbed his side, an action the FBI would say justified their decision to shoot arguing he was trying to reach for a 9 mm handgun authorities said they later found in his side pocket. Supporters and family however believe a different scenario: They said Finicum was not trying to reach for a gun but was grabbing the areas where the FBI had already shot him. Authorities reported firing three shots but witnesses in the truck with Finicum at the time put it closer to six or seven. It is unknown at this time which account is accurate. The family has paid for an independent autopsy and, Finicum family spokesperson Cherilyn Eager said Friday, they plan to release the results at another time. Many in attendance at the funeral described Finicum’s death as nothing short of murder. Valerie Sharp, 18, was one of four eyewitnesses in the truck when Finicum was shot. She shared her experience at a concert held Friday night after the funeral services. Valerie Sharp’s mother, Odalis Sharp, a single mother of 11 children from Auburn, Kansas, took her family to Oregon last month and remained at the refuge during Finicum’s stay. 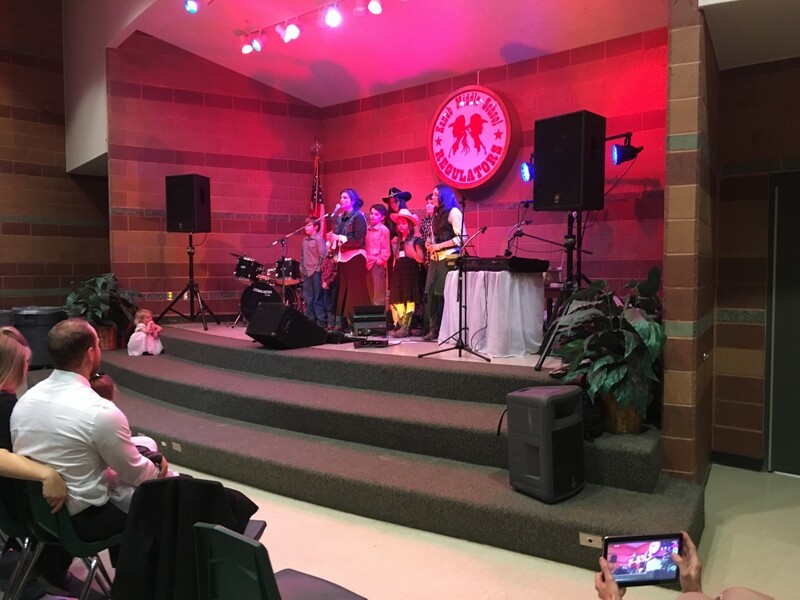 The Sharps hosted the concert Friday night that was initially open to the press but later closed to media. Dan Sabrosky, one of the bouncers at the door, told St. George News there were several in the concert who would be in danger from federal law enforcement if their faces were photographed or videotaped and “put out on the wire.” Sabrosky added that the group did believe the FBI was in Kanab Friday. St. George News was ultimately given permission to stay at the concert and record Victoria Sharp’s story but under the terms no video or photography would be taken. Some media eventually did sneak in and capture some photos after the event clearly became more than the door bouncers could handle. The crowd was also videotaping and photographing the concert sharing it on social media. Sabrosky told St. George News reporters the Sharps have hired a bodyguard for Valerie Sharp due to concerns about the FBI. Further details about her bodyguard were not provided. Finicum first became involved in the land-rights movement when he joined many at the 2014 Bundy standoff at Bunkerville, Nevada. Bundy had long refused to pay his grazing fees arguing the land did not belong to the federal government. Finicum went home from that event and, like his ally, cancelled his grazing permits. In a private interview with St. George News, Bundy told reporters Finicum had paid attention to what the real issues were about during the standoff. It was in this same video he shared his feelings about Dwight and Steven Hammond, ranchers in Oregon, who were ordered to return to prison after serving their original sentences. Finicum flew to Oregon in early January to participate in a rally for the Hammonds. Immediately after the event, he decided to follow Cliven Bundy’s sons Ammon and Ryan Bundy and others to take over the refuge. 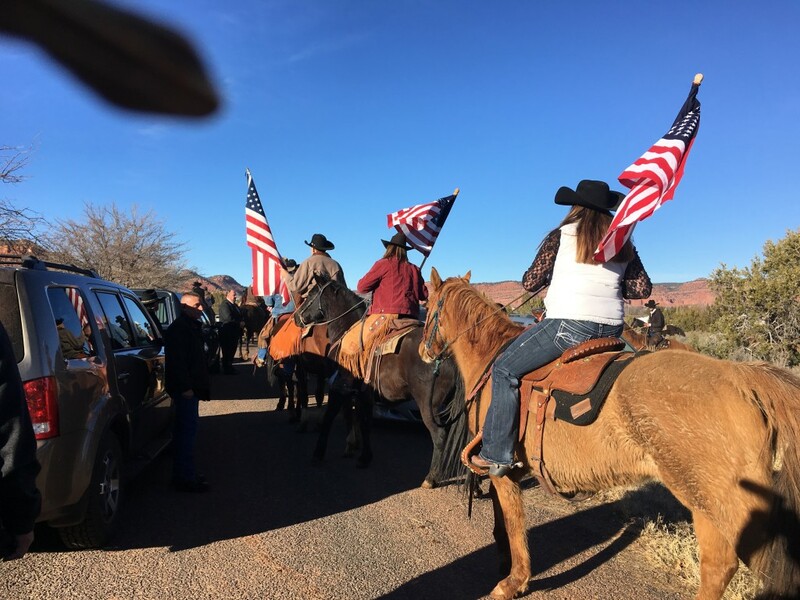 In a side matter: On Friday, Shawna Cox, who was in Finicum’s truck and recently indicted for her role in the occupation, was given permission to attend the funeral after her attorneys filed a last-ditch emergency motion in U.S. District Court. However, Cox was ordered to not talk to anyone about the events leading up to the indictment, the shooting or her charges. Patriot? No. Him and the Bundys cloak themselves with the good old red, white, and blue but they are no patriots. FAR from it. “We believe in being subject to kings, presidents, rulers, and magistrates, in obeying, honoring, and sustaining the law.” I guess he missed that part. It’s a sad day when someone who takes over a federal building while armed is considered a patriot by so many. I guess being mormon and wearing a cowboy hat while defying the law and running from the cops before reaching for a gun is the cool thing to do if you’re a true Utard. What a disgrace! It’s also clear that Tracie Sullivan is also a Bundy/Finicum supporter. Hey Tracie- the FBI didn’t shoot him, the Oregon State Police did. Just helping state the facts in this suicide by cop situation. The Constitution. Isn’t that what he supposedly was killed protecting? What’s that?? ““Please understand there are people here who cannot have their faces in the press,”?? Hmmm. Why didn’t those people STAY AT HOME instead of CHOOSING to attend a PUBLIC event?? I guess the organizers of this PUBLIC event only like FREEDOM when it suits them. Typical. While I’m here though, If the FBI was out to kill that day, why was he the ONLY ONE in that convoy who is dead? Why leave any witnesses? Why did they wait almost a month to do it? Why did they hold press conferences and negotiations and attempt to make compromises throughout the entire month leading up to that day? “Authorities reported firing three shots but witnesses in the truck with Finicum at the time put it closer to six or seven. It is unknown at this time which account is accurate.”, and in at least one interview, Valerie Sharp claims about 120 shots were fired. The survivors also claim that Finicum’s truck was riddled with bullets. Sounds like somebody is grossly exaggerating. Big surprise. Connection to reality has never been a strong suit of the Bundy’s and their ilk. I like to ask Bundy supporters why, if the truck was riddled with bullets as Valerie Sharp claimed, is ONLY ONE PERSON DEAD??? All I get is hateful replies though. I guess they don’t like me pointing out the flaws in their lies. Finicum’s vehicle was pelted with flash-bangs and sponge projectiles. Hysterical 18-year-old girl probably poor eye witness. Excellent pictorial coverage of this brave, courageous patriot’s final ceremonies. May he find peace in Heaven and may those who are irritated by his quest find pleasure in their angst. Courage and bravery don’t necessary go hand in hand with wisdom, good judgement and intelligence. LaVoy was deficient in the latter three attributes in has latter days. My angst is a lot more pleasurable than the cramped quarters of a pine box. I’m all for people protesting, peacefully, against that which they feel is unjust. I’m all against a bunch of Yahoos running around with guns, trying to provoke a confrontation with the authorities, and then crying about it when they get their wish. yes,you are Evil, dot dot, sick n sad you. Wow why isn’t digger here defending his hero ?